Today, in the 21st century, many nations continue to fight to shrink the gender gap which has often proved to be core to impeding the growth of entire nations. Leading relentless efforts to address this issue, non-governmental organization Tadwein hosted a one-day conference in collaboration with the World Wide Web Foundation. Throughout the day, an array of researchers and activists discussed matters of sexual health education and gender issues within the context of contemporary information and communication technology (ICT). The conference also comes during the “16 days of activism” campaign launched worldwide by UN Women, which looks to spur action to bring an end to gender-based violence. Despite Egypt being home to growing gender-based issues, the conference took a step further into shedding light on how other countries, including Sudan and Indonesia, address such problems hands-on. 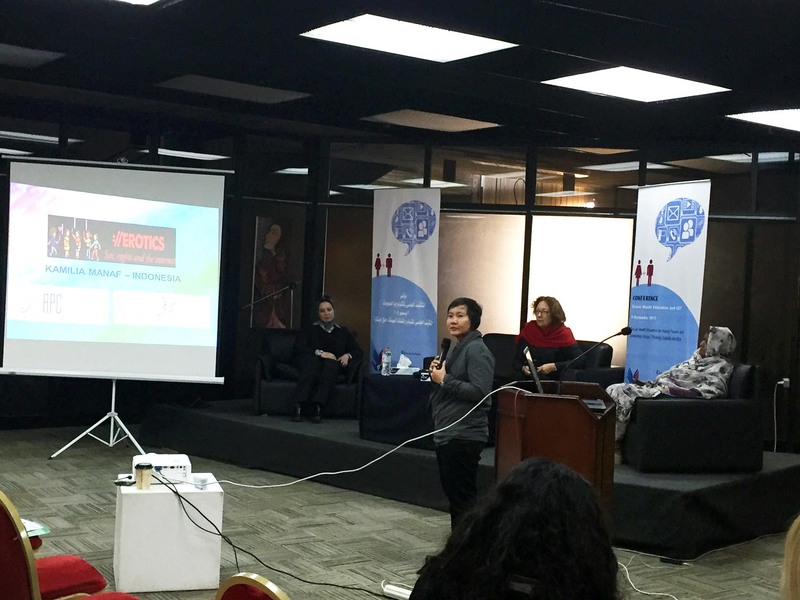 Amel Fahmy, director of Tadwein, launched the organization’s report on Egyptian women’s online presence in the urban poor communities of Cairo, which was conducted as part of a multi-country study. According to Tadwein’s report, despite steep poverty rates, more than half of Egyptian citizens in these areas have Internet access either through a computer or a mobile phone. However, there is a gender gap even in this area of research: While education levels did not affect Internet activity among men, women with lower levels of education were found to be far less likely to access the Internet on a regular basis. Furthermore, Fahmy noted that women respondents were found to be twice as likely as their male counterparts to experience sexual harassment through their phones or the Internet. While ICT is the problem in some ways, it also acts as a solution in other ways. Ma’looma, a recently launched Egyptian website that aims to raise awareness about issues related to sexual and reproductive health among the youth, uses a variety of platforms, including its website, Facebook page and a text messaging service to answer health-related questions and disseminate important information. Similarly, Kamilia Manaf from Indonesia’s Institute Pelangi Perempuan spoke of the increased use of the Internet in Indonesia as a space for public discourse on issues of sexuality. In Sudan, meanwhile, organizations are seeking to shatter the culture of “shame and blame” surrounding sexuality and the women’s issues through radio talk shows. According to researcher Ikhlas Nour, these issues carry a heavy social stigma in Sudan and discussing them through a widely accessible medium such as the radio is an important step in breaking the barrier and promoting a healthier environment for women. However, there remain a number of issues that continue to persist away from the technological arena. Omaima El-Gibaly, Professor of Public Health at Assiut University, highlighted the prevalence of child marriages and the low levels of sexual health awareness among citizens in Upper Egypt. According to El-Gibaly’s research, almost a third of the respondents from the governorates of Assiut and Sohag were involved in an early marriage but none of them were coerced by their parents, as many people believe is the case. Instead, she says that the prevalent social ideology is that marriage is a desirable milestone to reach, particularly as social norms place a great deal of importance on giving birth and expanding the family. This ideology therefore permeates the youth’s beliefs and, coupled with the lack of information on the risks related to early marriage, allowing the tradition to carry on, despite national laws banning the practice. El-Gibaly also stressed on the lack of importance given to post-natal care and sexual health issues, which are perhaps a reflection of the lack of services that focus on these issues. Head of the Gender Program at the Egyptian Initiative for Personal Rights (EIPR) Dalia Abdelhamid said that the youth in particular might face hurdles to access services related to sexual and reproductive health. An EIPR research study on “youth-friendly” sexual health clinics revealed that many of these clinics are often difficult to access and do not always provide the required services on a consistent basis. According to Abdelhamid, the study also showed that the healthcare providers at these clinics do not always protect patients’ privacy and at times even talked to patients based on religious and social norms, rather than medical information. Abdelhamid also said that nongovernmental clinics generally fare better than their governmental counterparts, which shows the extent to which civil society is left to carry the heavier load when it comes to issues of sexual and reproductive health. According to the United Nations Population Fund (UNFPA), reproductive health services in Egypt are only provided to married females, despite these services being necessary for women throughout their entire life cycles. UNFPA also notes that reproductive and sexual health education are not part of Egyptian school curricula, furthering the lack of awareness surrounding these important issues.